Ofsted's controversial new report on Reception teaching is an opportunity to discuss what really matters in the early years. As I write this, my four-year-old son, who will start school this September, is working hard on the garden (or ‘farm’ as he describes it, after watching CBeebies’ inspirational Down on the Farm series). Apart from the day he was born, he has spent some time outside every day of his life. It’s where he loves to be, and what he loves to do. We count outside, draw letters in his sand table, grow vegetables, watch clouds roll by... We tend the imaginary animals on the ‘farm’ and design field systems to get the most out of the space. Recently, we’ve been watching the family of six fox cubs, resident in the garden, tumbling and chasing, frolicking and play fighting, as they make the transition from cub to adult. (They sure do know how to play!) No day is complete without fresh air, weather and mud. Plenty of mud. It was with some trepidation that I read Ofsted’s Bold Beginnings report, based on the Reception curriculum in a selection of good and outstanding primary schools. Would its recommendations support learning for children like my son? My trepidation came partly from what I had seen on social media, namely the wide criticism of the report for its apparent ideology and a lack of an evidence base for its recommendations. It bothered me that in all but one of the pictures on the front cover, the children are portrayed inside and in most of them, they are sitting down. Seeing first-hand how important it is for children to have access to the broadest, most active curriculum possible, I wondered what message this report was giving me. Starting school can be a worrying time for parents, not least those who are teachers themselves! Bold Beginnings was published after I had visited prospective primary schools for my son. Had it been published before those visits, I would definitely have asked what heads and Reception staff thought of it and how they planned to use it. There is no doubt that it has shone a light on the issues and tensions that exist in the Reception year, sitting as it does at the end of the EYFS and before the start of Year 1. My son is currently in a Montessori setting, so his desire to learn outside and make the most of his environment has been utterly unhindered (as it often is in non-Montessori settings too). His intrinsic motivation to learn has also been encouraged and his learning path each day can take many twists and turns. Children his age don’t learn in linear chunks or units! I had already seen that when some schools detect a gap in the transition between Reception and Year 1, some choose to stretch Reception philosophy up into Year 1 and some choose to exert downward pressure into Reception, so I would have been particularly interested to hear headteachers’ thoughts on the document before making my school choices. In his blog post, ‘On Ofsted’s early years report: some dos and don’ts for Professor Mujis to consider’ Peter Ford, who works in vocational FE, explains why the report has been the subject of such criticism. First Ford points to inconsistency between the commissioned review of the curriculum and what appears to be the intention of the report. The aim of the report is not clear, Ford says, and the rest of the report lacks clarity. Ford also points to inconsistencies in the report’s methodology, purpose, and aims, as being problematic, as well as the types of data included, the use of woolly terms such as ‘some of’, ‘most of’, ‘too many’ and ‘too few’, and unreferenced claims and generalisations. I could go on. What struck me when reading the report was the way in which play is portrayed. It seems highly controversial to link play primarily to developing a child’s personal, social and emotional skills. Spend a day with my boy and it’s obvious that there are different types of play and to distinguish them from learning is folly. I looked to the recommendations for greater clarity, but they do not mention play. What I did see in the first recommendation, however, is that schools should ‘make sure that the teaching of reading, including systematic synthetic phonics, is the core purpose of the Reception Year’. Really? I asked Ruth Swailes, school improvement adviser, education consultant and national leadership consultant with Early Excellence what her thoughts are on the prominence given to reading and phonics in Bold Beginnings. She told me that ‘Young children need a focus on personal and social development, communication and language, self-regulation and executive functioning as well as on reading. 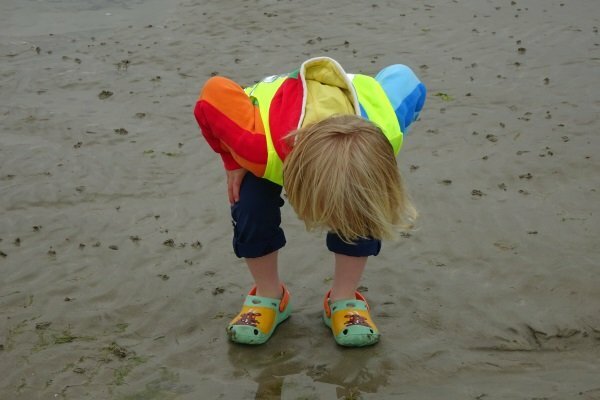 What is a parent to think when on the one hand we have a report from Ofsted on Reception, the most relevant phase of education for those of us who will be sending our darlings to schools in September, and on the other hand a veritable barrage of criticism of the report that looks set to influence early years departments up and down the land? While I hear rumours, both local and national, that Bold Beginnings is being used to justify what experts may view as developmentally inappropriate changes to the Reception year, it is clear that the document is not intended to replace the Early Years Foundation Stage or Ofsted’s definition of teaching. As Gill Jones said, schools should be doing what they feel is right for children, not what they think Ofsted wants to see. Bold Beginnings is an opportunity to debate what happens in Reception classes and to look at the core of the report, in particular the references to language, literacy and maths, and to use it as an opportunity to do an evaluation and ask pertinent questions of what the school offers in Reception. Ofsted will not inspect schools against Bold Beginnings. I don’t think I can be alone in wanting my son’s time in Reception to be about now. Not biding time until Year 1, or frantically cramming so that Year 1 isn’t a leap. I want his learning and experiences to date to be built on and developed. And looking around schools last Autumn there was no doubt that they cared deeply about giving children developmentally appropriate experiences in Reception. We already have the youngest school starting age in the developed world (with the exception of Ireland and New Zealand) so if we’re going to insist on taking children out of their pre-school experiences and into school so early, we have got to make sure we get it right and that means utilising all the research, guidance and early years experts we can. As Ruth explained to me, 'the National Curriculum has changed over time, but child development hasn’t'. My son will arrive at school full of the sheer joy of learning, and the Reception year is when that joy gets cemented in the school context. While his bold beginnings were actually more than four years ago (and boy were they bold! ), it certainly feels that the Reception year is undergoing a sharp focus, and I for one hope that any redevelopments of this crucial year protect the undeniable importance of play in all its guises, and the broadest curriculum possible. 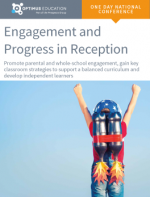 Our Engagement & Progress in Reception conference will be an opportunity to hear from schools that were involved in the Bold Beginnings report, and take away practical advice for delivering a balanced curriculum in Reception. Read the full programme for details.